Ordinance No. 07, Series of 2012 - Ordinance Amending Section 50 (Styrofoam) of Market Code. Ordinance No. 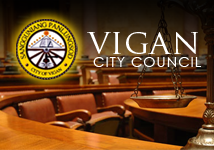 08, Series of 2012 - Ordinance Amending Section 67 of the Vigan Market Code. Ordinance No.06, Series of 2009 -Amending Section 59 of Market Code. Ordinance No.8, Series of 2008 - Designating the entry point of meat, poultry. Ordinance No.11,Series of 1997- New Vigan Market Code. Ordinance No 1,Series 1995- Fixing a fee fioor weighing animals at the Vigan Public Slaughterhouse. Ordinance No 5,Series of 2004 A - Amending Sec. 21 of the Vigan Market Code. Ordinance No 6,Series 1993 - Ante-mortem inspection at the Vigan Slaughterhouse.